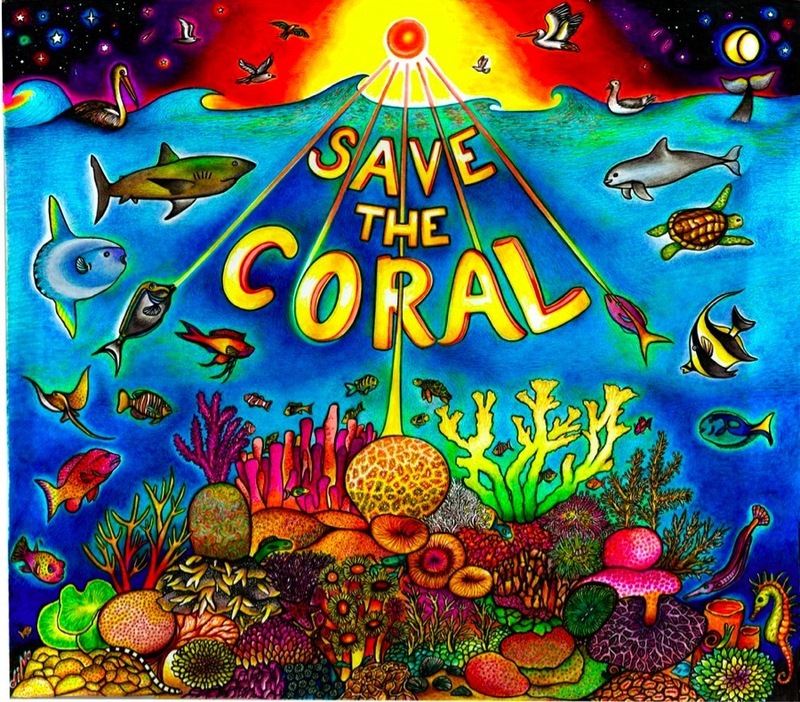 This Artwork is designed for www.SAVEeARTh.us So that the extremely important knowledge regarding the Danger that Our Ocean’s Coral is in, can be seen and known to all. This drawing features over 25 of the most endangered coral species that are facing extinction from a myriad of factors. All of the species as recognized by NOAA are represented, along with much of the fish and sea life that depends on the coral habitats for survival and protection. Some dangers facing corals are TOXIC SUNSCREENS, Oil and shipping routes disrupting sea life, chemical spills, overfishing, toxic dumping, landfills emptying into the sea after storms, and general neglect on a global level. This ALL must change. People NEED to smarten up about what EVERYONE does to Our oceans and planet. We cannot continue on our current path, we will soon be overcome by plastic, trash, and chemicals that corrode our world. The animals are suffering, our water is being poisoned, and everyone on eARTh is affected. We ALL must raise awareness for Coral health and all play our parts in protecting and restoring these beautiful lifeforms of eARTh that are essential to a healthy ecosystem. YES, corals are ALIVE. On a personal note, in the late 1990s my family would go on Princess cruises occasionally and one place we stopped was a part of the Bahamas that the cruiseline had purchased and named Princess Cays. One of my first walks on this shore was one of the most memorable beach walks of my life. Every single step was in between something beautifully colored and alive. We took care with each step not to hurt anything, and as a result really got to take in and experience every step we took. Not only did it look beautiful, but you could feel the LIFEFORCE of everything. The Color, the feel, Everything was Perfect. Every single time i went back to the Princess Cays from then on, i noticed degradation in the coral. A little bit each time, until the entire walk was dead, bleached coral. It is sad to walk on it now having witnessed such a quick and total destruction. If WE are not careful, this could happen everywhere. If the Ocean dies, we are close behind. SAVE THE CORAL.